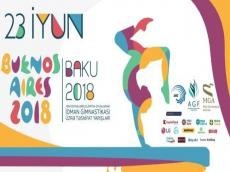 Baku will host a gymnastics qualifying tournament of Youth Olympic Games Buenos Aires 2018 at the National Gymnastics Arena on June 23. The tournament will feature 58 male and 54 female gymnasts from 33 countries. Azerbaijan`s hopes will be pinned on Samira Gahramanova, Agamurad Gahramanov and Samad Mammadli.